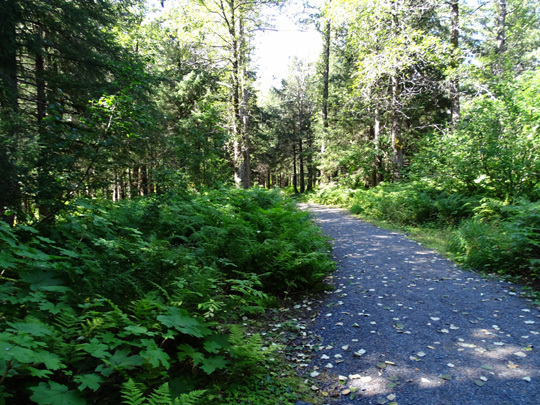 all this forest has to offer or a picture-perfect place to just sit and relax." 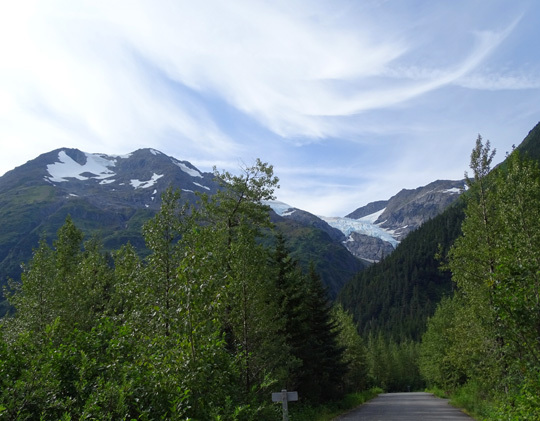 Portage Valley, which stretches about six miles from the western end of Turnagain Arm to the small seaport town of Whittier on Prince William Sound, was one of our favorite parts of South Central Alaska when we visited here three years ago. 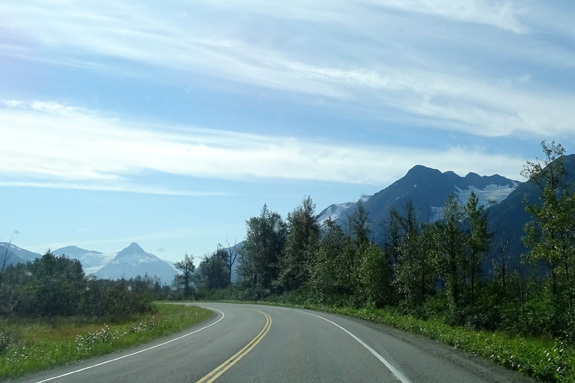 The scenic valley is sandwiched between two glaciated mountain ranges -- the Chugach and the Kenai. 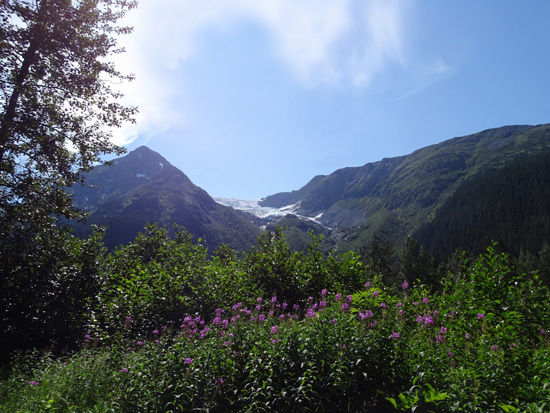 Numerous glaciers can be seen from the roads, railroad track, and trails in the valley. 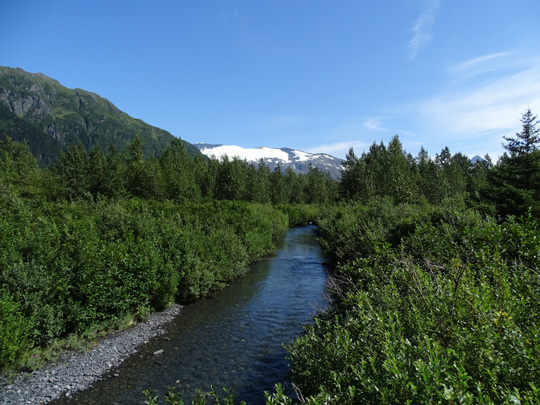 Water and ice flow into beautiful glacier-blue streams, ponds, and lakes where several species of salmon return each summer to complete their life cycle. Wildflowers and wildlife are abundant. 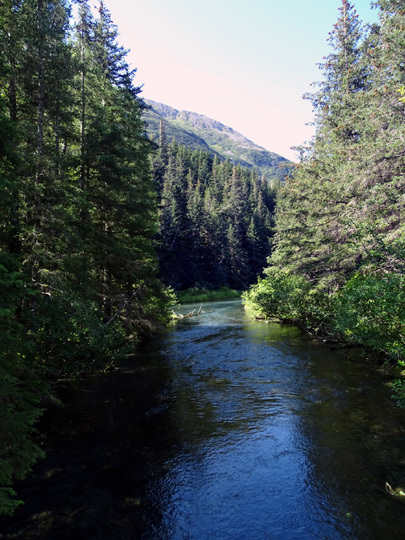 There are several private and public campgrounds, one of the best National Forest Service (NFS) visitor centers anywhere in America, and recreational opportunities galore. 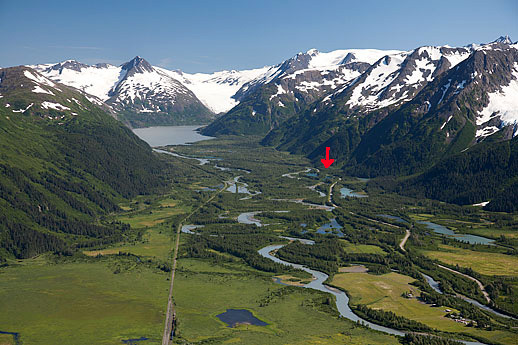 The aerial photo above gives a great overview of the end of the valley near Portage Lake. It is from this USDA website. I found it while looking for a map of the road through the valley from Portage to Whittier. The photo is a better representation than any map I found. 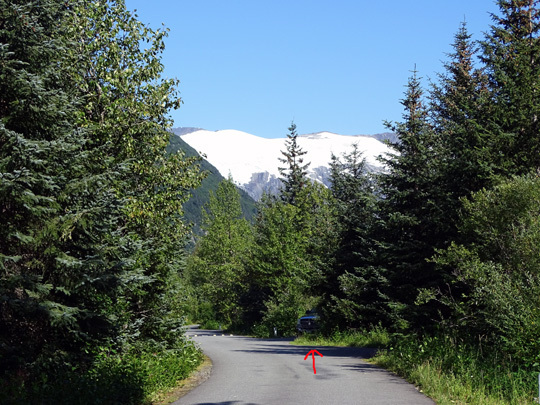 The arrow marks the approximate location of Williwaw Campground. 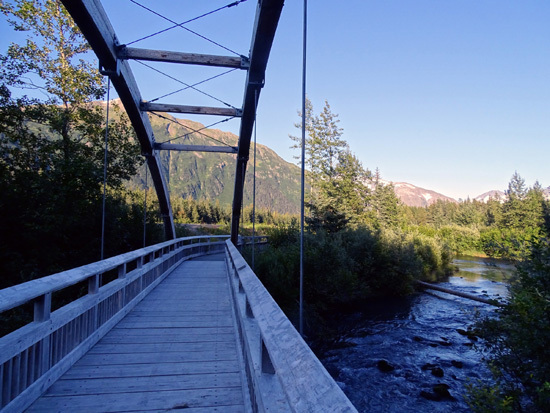 In this entry I'll cover the short drive from Anchorage to Portage Valley, the Williwaw NFS Campground, and two bike rides on the uber-scenic Williwaw Nature Trail, Moose Flats, and theTrail of Blue Ice, where visitors can see at least five hanging glaciers from the multi-use path -- more than can be seen from the road. Since our drive was a mere 62 miles today, we took our time getting ready to leave Black Spruce FamCamp at JBER in northern metro Anchorage. 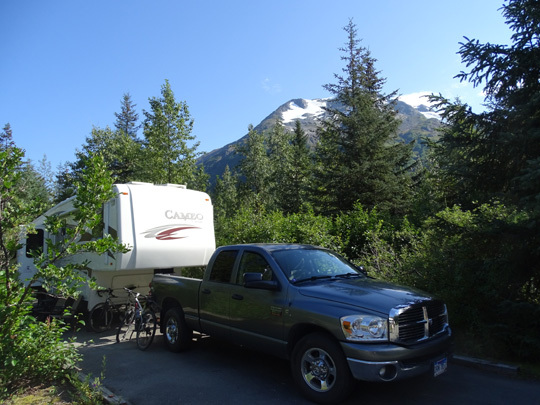 We got to Williwaw Campground about 10:15 AM with no stops in town or along Turnagain Arm. 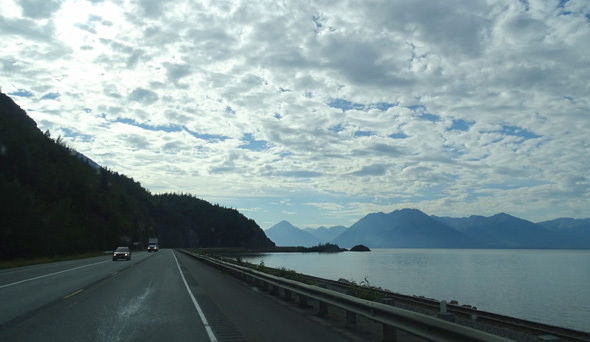 It was early enough on Sunday that traffic on the Seward Highway wasn't bad yet. It was sobering when we passed the location where the horrific wreck occurred near Portage just two days ago. Despite the heavy news coverage of that tragedy, some drivers were still exceeding the speed limit, following too closely, and passing when it wasn't very safe. 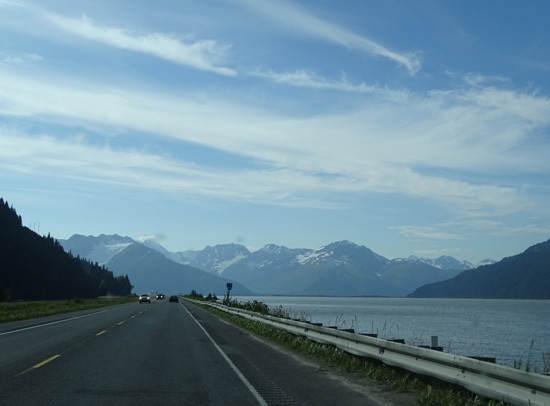 The tide in Turnagain Arm was the highest this morning of any of the times we've driven this route. It was beautiful, although it's always hard for me to take pictures in the morning going eastbound, facing the sun. 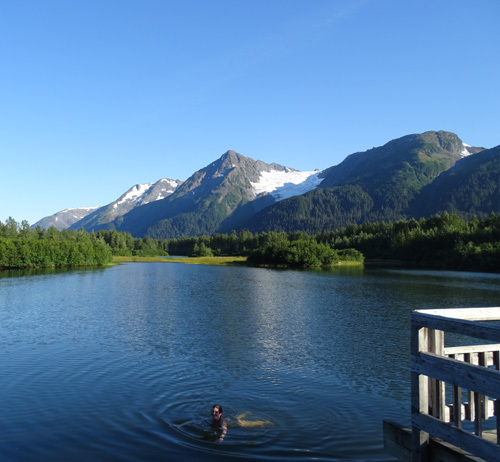 Ironically, there was more blue sky in Portage Valley this today than along the water -- and no wind. 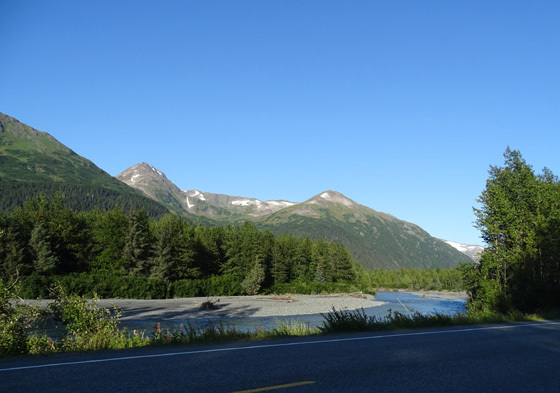 Because Portage Valley lies between Turnagain Arm and Prince William Sound it often gets gale-force winds and sudden weather changes. Today couldn't have been any better, though. It was much more pleasant than when it's been raining down here. 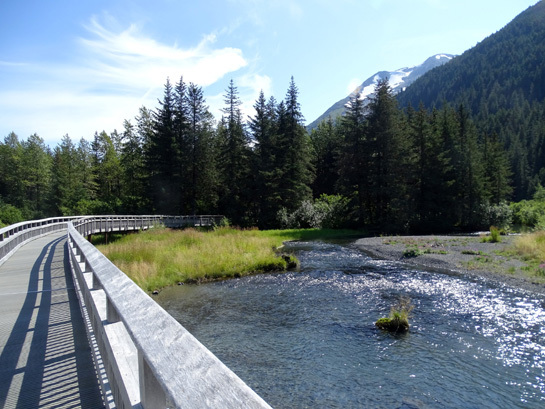 The National Forest Service operates two very nice campgrounds in Portage Valley -- Williwaw and Black Bear. 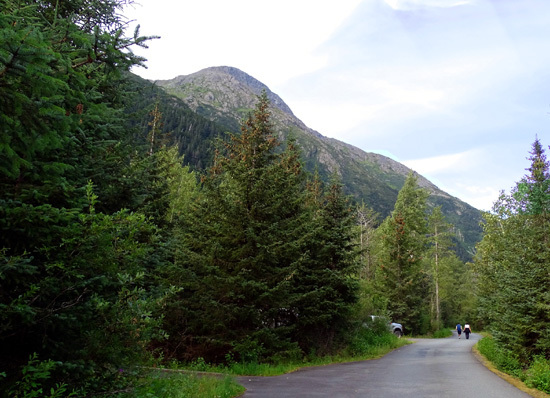 Per the Forest Service's web description of the campgrounds, Black Bear is smaller, more rustic, and has limited views of the surroundings mountains and glaciers because of all its tall trees. It is a great place for tents and smaller RVs. 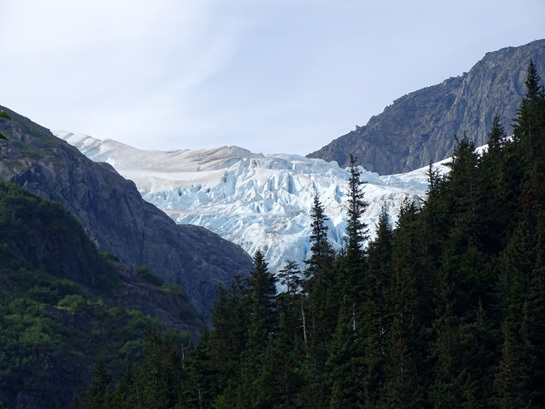 Williwaw, which means "big wind," has better views of the mountains and glaciers, more sites, and can accommodate larger rigs. The long loops are paved and wide enough for large RVs to pass through without hitting any branches. Most of the 60 sites are long enough for a big RV but not all of them have adequate turning room for our truck and 36-foot 5thwheel. Some sites can be reserved; others are first-come, first-served. 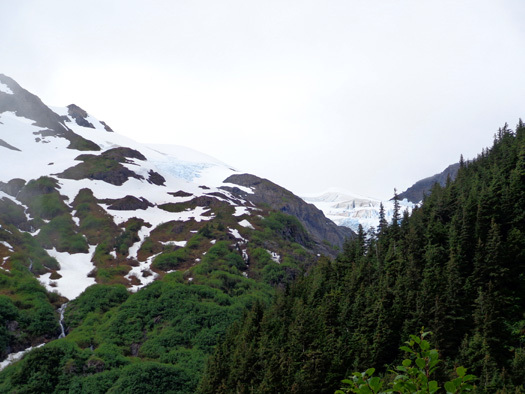 Middle Glacier (enlarged below), which we could see from our living room windows. If it hadn't continued raining that week, we would have enjoyed staying more than one night. Several months ago we made reservations for two short periods of time in early August. 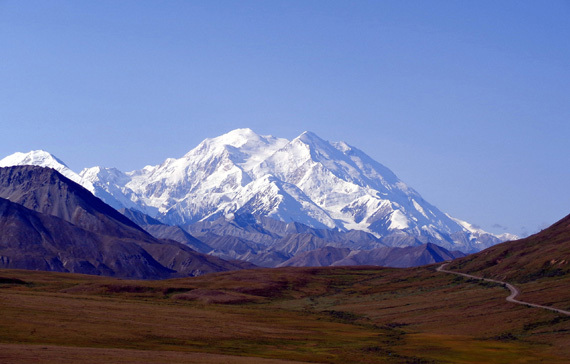 There are more visitors to Alaska this year and we wanted to be assured of a spot. We still have glacier views but they are easier to see from outside the camper. 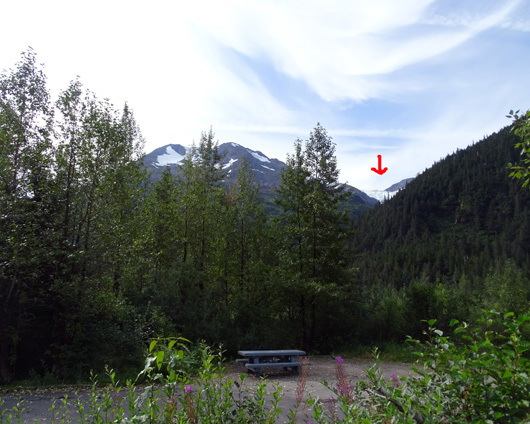 Arrow marks our truck; a big glacier near Porter Lake is visible a few feet past our site. Sites at Williwaw have a paved RV pad, fire pit, and room to pitch a tent on gravel next to the picnic table. There are several water pumps and vault toilets at Williwaw but no hookups or a dump station. Black Bear doesn't have a dump station either. That could be a problem for folks staying in RVs for more than a few days. Reservations can be made for up to 14 days. The cost is very reasonable and even more so at half off with our senior national parks pass. Quiet hours are from 10 PM to 6 AM. Generators can be run any time except then, which is very generous. We have a serviceable Verizon phone signal and our MiFi works OK here. That's pretty good for a valley surrounded by trees and mountains! We don�t have any TV reception at our site, though. That's our truck and current site from the other direction. The campground was full last night and most sites are full again tonight. It's a good thing we reserved a site. We got the camper set up quickly this morning and wasted no time getting out to enjoy the gorgeous scenery and weather that we didn't have three years ago when we were here. 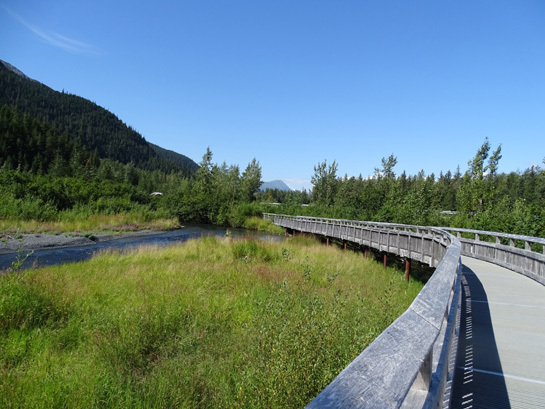 This place -- and Alaska in general -- is just awesome when it's sunny and dry!! Swimming in this pretty lake at Moose Flats wouldn't be much fun on a rainy or overcast day. 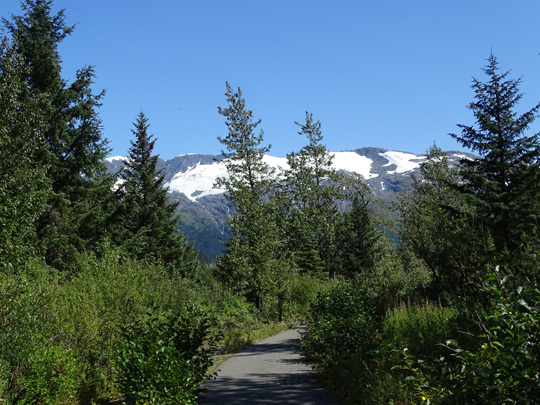 The main reason we like Portage Valley so much is the Trail of Blue Ice and other connecting multi-use paths. We walked and rode them on our bikes several times in 2012 ( July 15, July 16, and August 25) and wanted to enjoy them again this summer. There are lots of photos and information about the trails in those three entries so I won't repeat all of it again now. 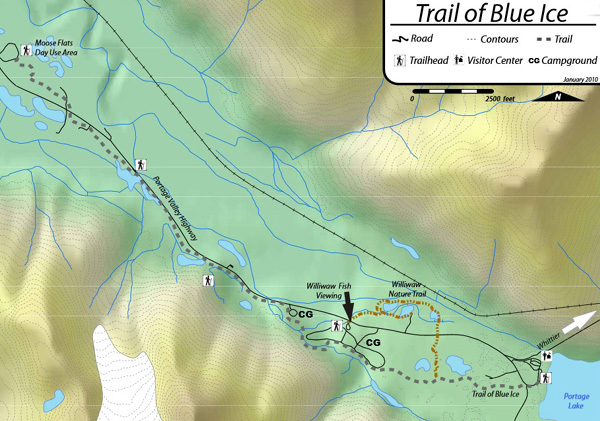 The Trail of Blue Ice is marked with a gray dotted line, the Williwaw Nature Trail a yellow dotted line, and Portage Valley Rd. a thin black line. Our campground is the "CG" with the loops; Black Bear CG is to the left of it. The photos in the rest of this entry are from bike rides we did on Sunday afternoon and Monday evening. This afternoon Jim rode his bike 12 miles and I rode 13. Some of it was together, some separately on the Trail of Blue Ice and the Williwaw Nature Trail. We started together on the Nature Trail so we could hunt for salmon in the little channels where they spawn, then went our separate ways. Jim also took Casey a total of at least three miles with the bike in two separate "runs" (next photo) both days. I walked the dogs several times in the campground for at least two miles total each day. We were outside a lot more than inside both days. Like I said, we wanted to get out and enjoy the fantastic weather and scenery! 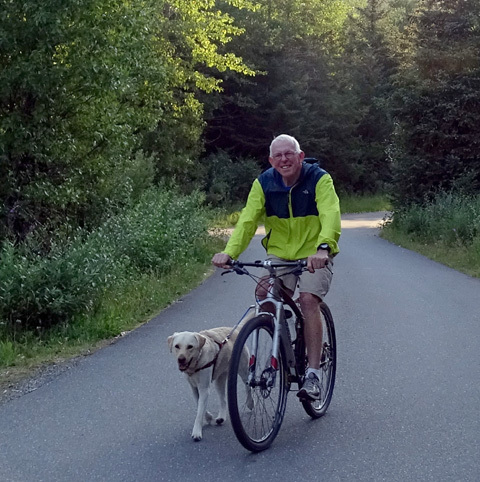 Jim rides slowly with Casey in the campground Sunday evening. The second evening after supper we rode our bikes again separately. 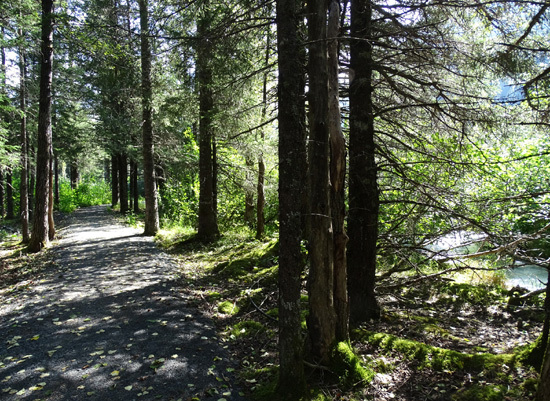 I rode 8+ miles on the Nature Trail (saw the red salmon across the road from the fish viewing area again) and west on the Trail of Blue Ice to the Moose Flats Day Use Area. It was my first time riding all the trail options at Moose Flats. It was very pleasant riding when it was cooler (mid-60s F.) in the evening -- and we love the long hours of daylight up here. 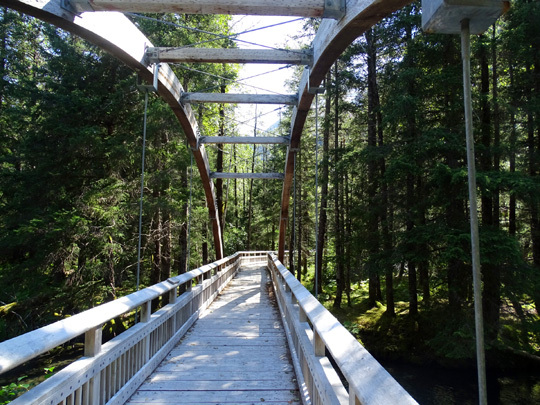 I absolutely love the graceful elegance of the two suspension bridges. 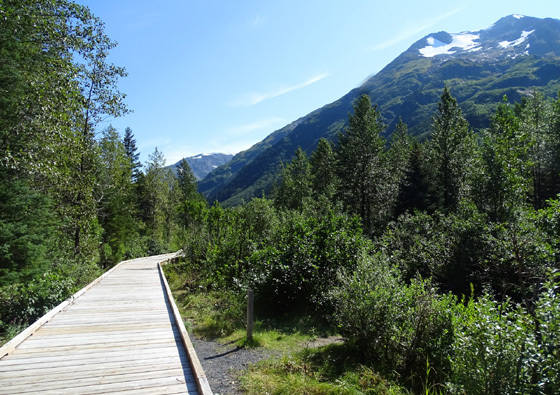 As you can see on the map, the trail runs for five miles east-west from the NFS Moose Flats day use area to the Begich, Boggs Visitor Center at the NW corner of Portage Lake. 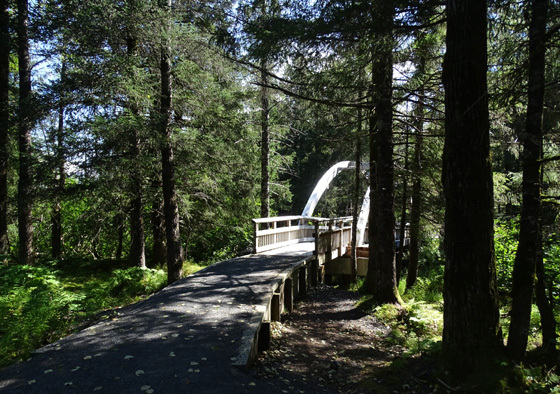 There are several access points, including both campgrounds. 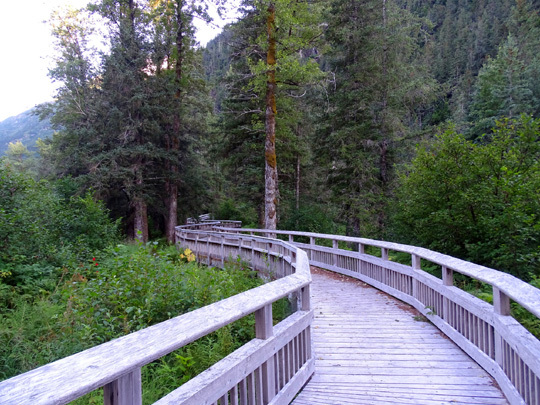 However, there are open spaces where hikers and cyclists can get more views than in the forest. 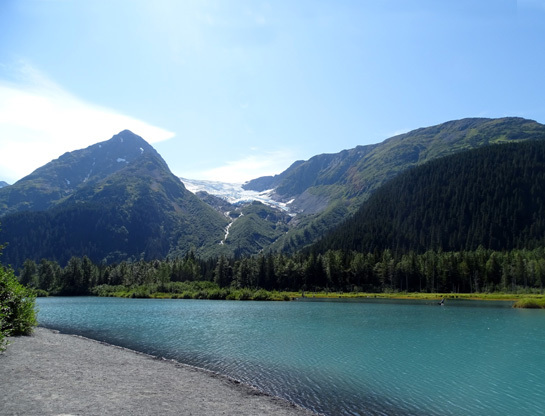 The Trail of Blue Ice is partly paved between Williwaw CG and the Begich, Boggs Visitor Center.